Seven communities of women religious, who are either based in the Archdiocese of Indianapolis or whose members minister here, recently came together to form a committee to foster women’s vocations to religious life in central and southern Indiana. Those communities were the Oldenburg-based Congregation of the Sisters of the Third Order of St. Francis, the Daughters of Charity, the Little Sisters of the Poor, the Sisters of Charity, the Sisters of St. Benedict of Our Lady of Grace Monastery in Beech Grove and of Monastery Immaculate Conception in Ferdinand, Ind., in the Evansville Diocese, and the Sisters of Providence of Saint Mary-of-the-Woods. Providence Sister Jenny Howard, the vocations director of her community, said there has been the perception in the past that religious communities are sometimes in competition for prospective new members. To kick off this renewed collaboration, the committee chose to sponsor a nun run, which some of the vocations directors had been involved with previously in Chicago. “I found them very effective,” said Daughter of Charity Theresa Sullivan, the vocations director for a Midwestern province in her order. Members of her order minister at St. Vincent Hospital in Indianapolis. Theresa Mills, 26, a member of St. Boniface Parish in Lafayette, Ind., in the Lafayette Diocese, participated in the nun run and also found it effective. The nun run started on the evening of Feb. 26 with Mass celebrated by the archdiocesan vocations director, Father Eric Johnson, at Our Lady of Grace Monastery in Beech Grove. That evening, the participants met with the Benedictine sisters of that community and of Monastery Immaculate Conception. 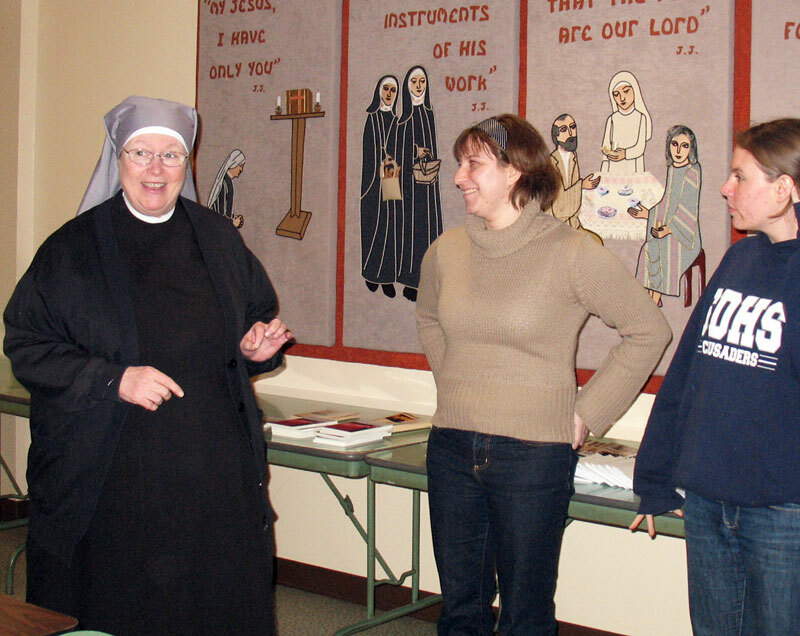 After spending the night at the monastery in Beech Grove, the participants visited and had breakfast on Feb. 27 with members of the Sisters of Providence in Indianapolis. They later had lunch with Franciscan sisters at Marian University in Indianapolis. In the afternoon, they met with members of the Daughters of Charity and Sisters of Charity at their convent adjacent to St. Vincent Hospital then with members of the Little Sisters of the Poor at their St. Augustine Home for the Aged in Indianapolis. Want to learn more about the religious communities behind the ‘nun run’? For the Oldenburg-based Congregation of the Sisters of the Third Order of St. Francis, log on to www.oldenburgfranciscans.org. For the Daughters of Charity, log on to www.doc-ecp.org. For the Little Sisters of the Poor, log on to www.littlesistersofthepoor.org. For the Sisters of Charity, log on to www.srcharitycinti.org. For the Sisters of St. Benedict of Our Lady of Grace Monastery in Beech Grove, log on to www.benedictine.com. For the Sisters of St. Benedict of Monastery Immaculate Conception in Ferdinand, Ind., log on to www.thedome.org. For the Sisters of Providence, log on to www.sistersofprovidence.org.